We have three different grades of towing memberships available. BoatUS has over 500,000 members currently enrolled! Even the most experienced captains could run into problems at sea. Accidents happen and things break. Towing rates average $250+ per hour without a membership. On average tows cost the user $750 and ungroundings cost $950 per incident. Having a membership could save you a lot of money and headache later. If you would like to sign up online you can click here. 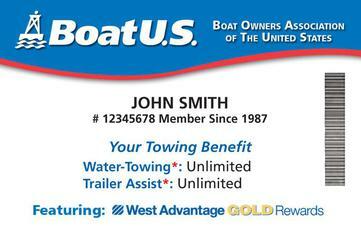 A membership with BoatUS also gets you enrolled in the West Advantage rewards program through West Marine!